Fully TUV GS Approved. 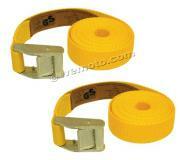 PE manufactured webbing strap. Cambuckle tensile strength 600kgs. Webbing tensile strength 1100kgs. Hook tensile strength 700kgs. Length 1.8 metres x width 25mm. Robust auto-lock securing mechanism. Ideal for strapping and securing motorcycles, ATVs and Jetskis. Fully TUV GS Approved. 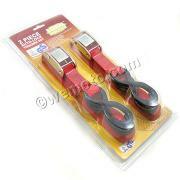 PE manufactured webbing strap. Quick easy release. 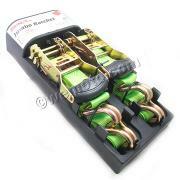 Ratchet tensile strength 700kgs. Webbing tensile strength 800kgs. Hook tensile strength 700kgs. Length 5 metres x width 25mm. Robust ratchet securing mechanism. 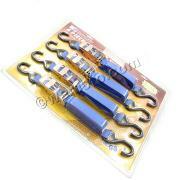 Ideal for strapping and securing motorcycles, ATVs and Jetskis. Length 3m x Width 30mm. Break Strength 1134kgs. TUV GS Approved.